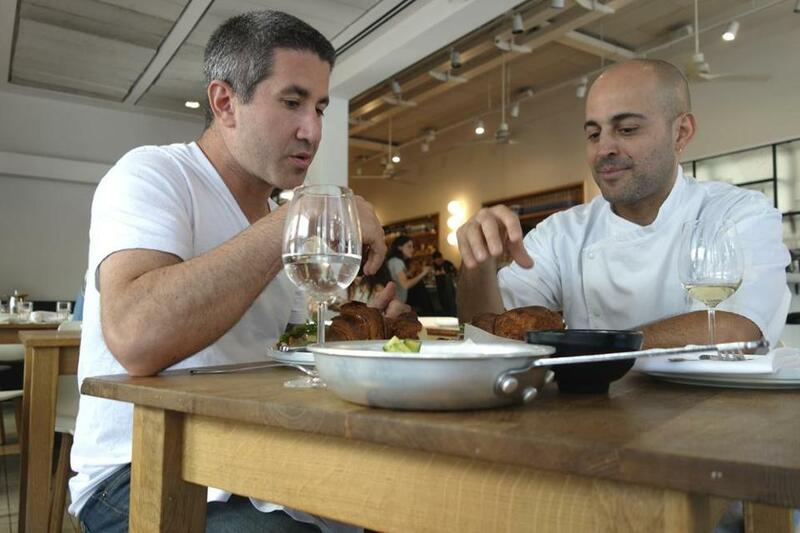 Michael Solomonov (left) and Meir Adoni at Mizlala in Tel Aviv tasting kubaneh, a Yemenite Sabbath bread. When filmmaker Roger Sherman was looking for a partner to help tell the story of Israel’s culinary revolution, he couldn’t have found a better candidate than Philadelphia-based chef Michael Solomonov, who has received wide acclaim for his personal and modern Israeli cuisine. This year, Solomonov won two James Beard awards, including cookbook of the year, for “Zahav: A World of Israeli Cooking,” and was a finalist for outstanding chef. Solomonov is the on-screen guide for Sherman’s “In Search of Israeli Cuisine,” an exploration of the country’s vibrant food scene, which often takes a back seat to political news. Born in Israel and raised in Pittsburgh, Solomonov has long been a champion of the diverse food of Israel — a country the size of New Jersey whose residents represent many different countries of origin. “Every single one of those cultures or cuisines, they all brought it from somewhere else. That’s what Israeli food is,” Solomonov says. Q. How do you differentiate between Israeli and Jewish cuisine? A. Israel is made up of everybody — Jews, Christians, Muslims, Druze. There’s also kind of a negative connotation when you hear “Jewish food.” You think blintzes or boiled chicken, borscht. For a long time people used the words “Middle Eastern,” “Mediterranean,” or “Jewish” for the food. They didn’t give credit to the country for having its own cuisine. Q. What defines that cuisine? A. Israeli food takes influence from arguably 160 different places. From a cooking and dining perspective, it’s super stimulating and exciting. Very vegetable-forward, which is a trend that is happening now. But over there, it’s always been the case. And it hasn’t been overdone yet. We have things like small plates, which everyone associated with tapas, although small plates were happening in the Middle East for maybe 1,000 years before tapas. Q. Do you see similarities between Israeli and American food culture? A. This country is a land of immigrants, as is Israel. There are native folks in both, but it’s really about the mosaic, the tapestry, the melting pot. It’s all the different influences and combinations in one place. These are newer countries. These are both groups of people who are doing things that are out of the ordinary. Our values are very similar. You have so many different people coming from all over the place, coming to one place basically at the same time period, within 100 years. You have something fantastic. You have progression. You’ve got change. Q. Where are the different cultures most apparent? A. When you go to someone’s house for Shabbat, you see exactly where people have come from. After the diaspora, people were moved far and were by themselves for a very long time. They considered their Judaism to be the purest form because they were so far removed from everyone else for so long. That translates to the food as well. They all had kosher laws that had to dictate exactly what they could cook. You have these cuisines that are molded by these laws, customs, and traditions that are related to the Bible. Then they all end up in this tiny piece of land, which from an agricultural perspective is very, very cool because that’s where modern agriculture started. Q. The film explores the restaurant culture in Tel Aviv. What would a visitor be surprised to find there? A. Oh my God, you’d find an incredibly fun city that doesn’t sleep. It’s a city that’s tremendously progressive and liberal. The food represents what everyone is doing there. There are hipsters, artists, business people. There’s cool fashion and great music. It’s an extremely open micro culture. It goes back to the geographic thing. Tel Aviv and Jerusalem are like 60 miles away, if that. But they’re completely opposite ends of the spectrum. Q. How is the food you serve different from what you might find in Israel? Michael Solomonov and Roger Sherman will host a screening of “In Search of Israeli Cuisine” May 16 at 7:30 p.m. at Jewish Arts Collaborative, Reimer Goldstein Theater, 333 Nahanton St., Newton Centre, 617-531-4610.